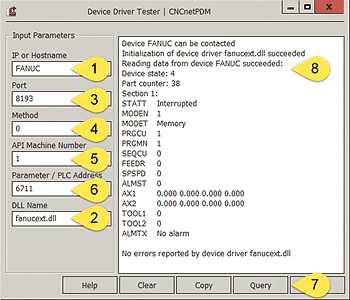 This utility program allows you to easily test and adjust the output of all available device drivers without the need to setup a device in CNCnetPDM. It also enables to verify correct communication with controllers and informs you about any issues. Extract devicedrivertester.exe from devicedrivertester.zip to the folder where you have installed CNCnetPDM. If needed, install a device driver and all required DLL files into the same directory. Some drivers support different methods to access the controller (e.g. Fanuc Ethernet or HSSB). Enter a specific method (4) if needed. If the previous step worked the program tries to read data from your controller as specified in the INI file. Any errors reported by the device driver are shown at the bottom of the output area. If none the program outputs ‘No errors reported by device driver name’. Most of the device drivers work with adjustable INI files that allow you to configure the driver according to your needs. To do so proceed as follows. Open the automatically generated INI file with a text editor f.i. notepad. There’s no need to close the program. Adjust the INI file e.g. change active state, commands, names or output sections and save it. To force the program to reload the INI file while running you can simply change a parameter that is NOT used by the current driver and click button [Query] again. For example for a Fanuc driver you could change ‘API Machine Number’ to a different value. Tip: An INI file customized with devicedrivertester.exe can also be used for CNCnetPDM. You simply have to copy the file and add an underscore + the device number to the file name f.i. fanucext_1000.ini for device number 1000. If you see an error message like ‘Error: Device cannot be contacted!’ your controller is not reachable at all. Please check your network connection. A message like ‘Error: Initialization of device driver failed!’ + ‘INIT: Windows socket error’ means that the controller is reachable but the device driver does not get data from the controller. In this case either the port number is wrong or the port number is blocked by your firewall. If you get results from the controller but errors show up for single functions you most likely query a function which is not supported by your device. You can either change the function call or deactivate it in the INI file. If everything looks ok but the only error you get is ‘Error: Initialization of device driver failed!’ the most likely reason is that you try to execute the program in a folder different to the one where CNCnetPDM is installed. Please run the program in the correct directory.